Every coastal town or city should have a fish and seafood restaurant like Riddle and Finns. In the years since the champagne and oyster bar first opened in the lanes it’s become something of a Brighton institution, with a loyal crowd of devoted customers and an enviable reputation. 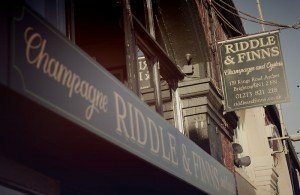 The inspiration for the original Riddle and Finns in Meeting House Lane apparently came from the high-end liquor shops and oyster bars of New York and Paris. There’s something deliciously decadent about the combination of fresh seafood, fine wines and fizz that really suits this city. It’s no surprise there’s now a second branch, perfectly positioned in an archway slap bang on the seafront, with glorious sea views. Of course friends have raved about the quality of the food and drinks at Riddles for years, yet I’d never eaten there myself until recently, heaven knows why. I love fish and sparkly wines of all varieties. The restaurant has a style that really suits its beachfront location. There’s an al fresco terrace which seats around 40 and the restaurant itself is tucked under an archway, so there’s a sweeping, rounded roof inside. The layout is spread over a few floors and the wooden floors, pale walls, twinkly chandeliers and big windows help to create a sense of space and calm. This is a very different look and feel to the original Riddles in Meeting House lane, which is much more like a fish mongers come bar, with low lighting, candles lit from morning until night in dramatic candelabras, white tiled walls, high stools and shared tables. At ground level there’s a lounge area with curved seating, where you can sip a pre or post-dinner cocktail if you so wish. There’s also the kitchen straight ahead and a charming private dining room hidden away towards the back. Upstairs is a dining area, as well as another set of stairs going up again that take you to another one facing the sea with a gorgeous arched window and a fabulous chandelier. A table by the window for a spot of lunch is a sought-after position, I’m sure. According to everything I’ve heard or read about Riddles, quality and sustainability is of paramount importance, which is reassuring. 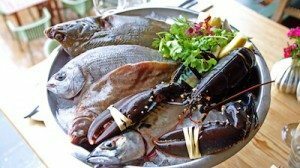 The fish comes directly off the boats from Brighton and Newhaven Fish Sales (BNFS) where freshness and provenance is guaranteed. Excited about the meal ahead, my friend and I chose a table in the middle of the top dining room beneath the bid chandelier, where there’d be good lighting for the photos accompanying this article. Our waitress brought us a basket of white rustic sourdough bread with three homemade dips: horseradish, garlic mayo and mackerel pate. They tasted really fresh and weren’t overpowering. Lovely to be given a variety of dips rather than just butter or oil and balsamic. 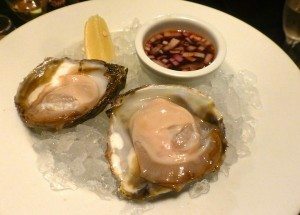 To celebrate my first visit to Riddles we ordered a glass each of the Court Garden Farm English sparkling wine from Sussex, plus two Loch Ryan Native oysters with lemon and shallot vinegar. They were superb; some of the best oysters I’ve eaten without a doubt. The bubbly was also a hit – crispy, not too dry and with biscuity overtones. 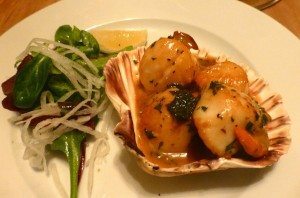 As a starter I chose the pan-fried Brighton scallops with lemon and parsley (£9.75), while my friend went for the ceviche (£8.75). It’s also possible to have the scallops with chorizo and chilli, which can work really well, but I wanted something simpler. Lemon, butter and parsley is a flavour combination that enhances the sweetness of the scallops and this dish was a fine example. I was given a serving of four plump and super fresh scallops served in a shell, which was a generous portion and very well presented. The tangy buttery glaze was silken, glistening and delicious with the juicy scallops. It was a winning starter that promised good things for the other courses. 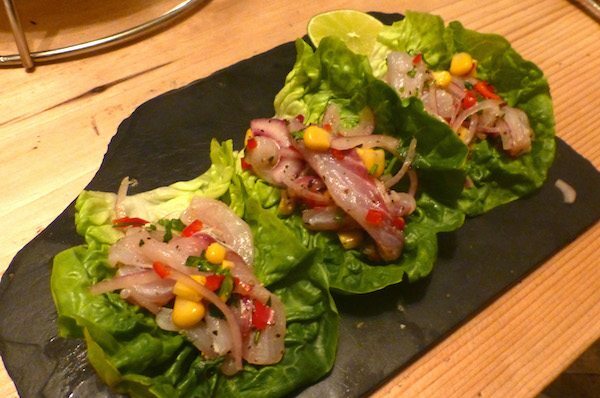 For the ceviche, three upturned cos lettuce leaves had been filled with thin slices of Black Bream marinated in citrus with hints of coriander and chilli. My friend described it as “subtle and delightful.” She let me try a taste and I had to agree how good it was – simple yet exciting, as ceviche can be when done well. 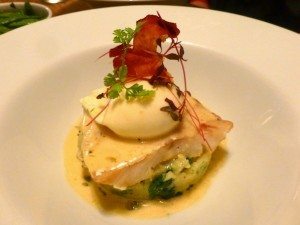 My main course was smoked haddock fillet sitting on a pile of colcannon, topped with a perfectly cooked poached egg, a generous pouring of creamy champagne sauce and crispy prosciutto ham (£16.95). It smelled and tasted delicious, with just the right amount of gentle smokiness from the fish. It many ways it reminded me of a posh but deconstructed fish pie, so if you feel like a change from Riddles’ actual fish pie (which is very popular) this is a great choice. It’s soft, comforting and tasty. My friend’s pan-fried fillet of wild sea bass came served with a ‘gratin’ comprising potato gnocchi, sun blushed tomatoes, black olives, marjoram and steamed broccoli stems (£19.50). The fish was chunky and juicy with a crispy, smoky skin. The gnocchi beneath were soft, warming and buttery, the richness balanced by a gentle acidity and saltiness from the tomatoes and olives. It was a very Mediterranean dish that could brighten any evening, whatever the season. For some extra green on our plates we also enjoyed a side order of mange tout served al dente and covered liberally in garlicky butter. That was a good choice too. So far, so delicious. The oysters, starters and main course fish dishes had been tremendous, all showing a fantastic knowledge of ingredients and culinary skill in the kitchen. 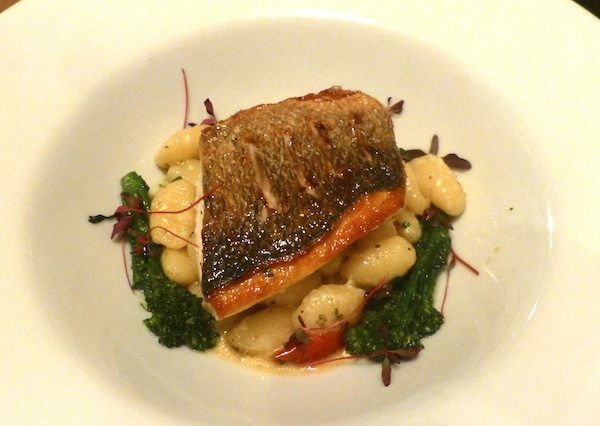 Fish and seafood is the speciality at Riddles, after all. 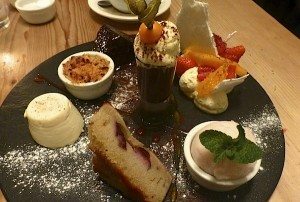 But many places have a speciality and then fall down when it comes to desserts, so we loosened our belts and decided on the “artisan of desserts” which gives you a proper run-through of most (if not all) of their puds. Oh my days! We were presented with seven mini versions of their desserts and it was an impressive, beautiful array. Both of us gasped, looked at it each other with wide eyes and picked up our spoons. We felt like adventurers about to climb a dessert mountain – it’s a tough life! Highlights were the squidgy, not too sweet dark chocolate cake, the little pot of apple crumble; crunchy and spicy, the cool and creamy panna cotta, as it should be. The Eton mess worked well because it was heavy on the cream, lighter on the meringue, which meant it wasn’t too sugary. Last, but by no means least, was a centrepiece chocolate mousse, which was a fantastic last taste to end the meal. I can honestly say that everything we had was incredible – well executed, delicious and beautifully presented. Both our waitress and the manager were welcoming, knowledgeable and considerate. We had a superb evening and I am thrilled to say I now know the secret to Riddles and it’s loyal customers. A visit there would be a highlight on anyone’s social foodie diary at anytime.